Letters From A Tapehead: The Body: "Shrouded" & "To Attempt Openness"
The Body: "Shrouded" & "To Attempt Openness"
I was a fan of The Body's very disturbing 2010 release, All the Waters of the Earth Turn to Blood. That being said, the band's 2013 release, Christs, Redeemers, escaped me, the misfortune of which has only been compounded by my awareness of the ridiculously uncomfortable tracks, "Shrouded" and "To Attempt Openness." The news of The Body's upcoming European tour brought me to the videos, which I feel compelled to attach because they're both very creepy, suitable visual components for the music. I consider The Body's art expert in its ability to remove any notion of joy from one's life, their amplified misery both compelling and awful. The Body - Shrouded from Thrill Jockey Records on Vimeo. The Body - To Attempt Openness from Thrill Jockey Records on Vimeo. All info comes courtesy of Thrill Jockey Records. We are very pleased to announce The Body will be making a rare appearance in Europe this April and May for a number of live dates and festival appearances! The heavy hitting duo will plunge us into apocalyptic darkness and bring about the very end of days with devastating assaults of volume and brutal sonic battery across our continent. 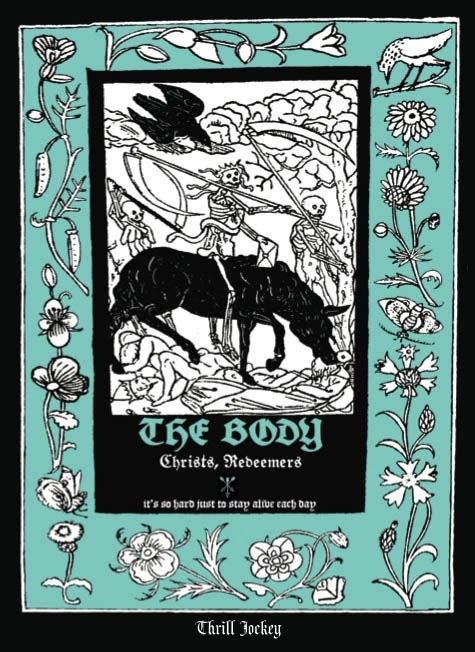 Their newest album Christs, Redeemers was voted in numerous 2013 end of year lists including #5 in Vice and #1 in The Quietus' Metal list. In reviews Metal Hammer called it an "awesomely unpleasant" record while The Wire considers it "an ambitious and sometimes breathtaking". Why not kickback and watch the video for the uncompromisingly eerie video for Shrouded or the stylishly shot To Attempt Openness. Full tour dates can be viewed below which includes festival slots at the famed Roadburn in Tilburg and Desert Fest in London. It has been said by more than a few intrepid listeners that The Body is the most brutal band on the planet. With ravishing grimness and impenetrable walls of noise, the duo of Chip King and Lee Buford create music that goes beyond what is normally considered harsh and violent, advocating a doctrine of misanthropy to those brave enough to take the plunge. Since their recording career began in earnest in 2004, The Body has expanded the definition of what it means to be a metal band, incorporating elements of noise, avant-garde composition, and experimental electronic music into their crushing doom and searing black metal foundation. Christs, Redeemers, the duo’s latest transmission of loathing and revulsion, finds King and Buford pushing even further into the horrifying unknown. Christs, Redeemers conjures this atmosphere of foreboding and isolation sonically, lyrically, and visually. The album opens with washes of sound and one forlorn voice penetrating the ether before launching into the brutal, ghostly dirge of “To Attempt Openness,” featuring frequent collaborators the Assembly of Light Choir. Unexpected bursts of noise, generated by guitars and electronics, puncture any sense of comfort or complacency and eerie samples float from the ether. King and Buford masterfully use the spectral space between the sounds to create almost unimaginable tension, employing silence as effectively as they do cacophony. This restraint, the knowledge of when to punish with volume and when to punish with the absence thereof, bestows the moments of fury with gravity. King’s screams are the centerpiece of the band’s aesthetic: panic-stricken and distraught, constantly on the verge of breaking. His lyrics are no less unhinged. On the album’s colossal closer “Bearer of Bad Tidings,” he shrieks “Life worthless and devoid of any meaning…all the world a grave.” Buford’s drums act as both a stabilizer and instigator of the madness, at times pushing the proceedings further into oblivion and others providing a lifeline for the listener as the guitars and electronics deliberately push you toward the brink. The album was recorded at Machines With Magnets in Pawtucket, RI, where The Body has recorded all previous album releases. During the recording process King and Buford play the double role of players and auteurs, bringing in a diverse group of collaborators, from the aforementioned Assembly of Light Choir to noise musician Work/Death and Ryan Seaton of Callers, to realize their hell scapes. They will be touring the US extensively in the fall.